A Year After NPR Ends Commenting, No Plans To Revive It : NPR Public Editor Some readers still pine for a comments section but NPR is focused elsewhere. The onslaught of complaints from NPR.org users who wanted to be able to comment has died down, but a few diehard fans continue to ask if NPR has plans to reintroduce the feature in some form. The current answer? No. "I don't foresee us, at this point, adding comments on the site," said Sara Kehaulani Goo, NPR's interim managing editor for digital news. Executives looked at many of the newer options out there, she said, "but we just haven't seen one that doesn't raise the same problems as before," including the need to add more employees to moderate the comments. In the year since NPR's decision, other news sites have also ended online comments, while The New York Times, for one, recently expanded the number of stories that allow readers to leave comments, thanks to new technology. NPR has added or soon will add other less-extensive options for readers to engage with NPR. A closed (users must ask to join) NPR Facebook group devoted to the topic Your Money and Your Life, which includes participation and monitoring by NPR staff, continues to grow, Goo said, and the conversations there have remained civil. Encouraged by that, NPR plans to introduce more such topic-driven groups, she said, although she declined to provide details for the moment. NPR has also experimented with ways to invite the audience to suggest stories and give input into stories in the works. A joint investigative story with ProPublica on maternal mortality, which NPR promoted on its social media channels, generated responses from more than 3,700 people who filled out the "I almost died" form; one of them ended up in a subsequent story. Listeners have been able to suggest story ideas at the Goats and Soda blog for several months and, more recently, have been offered the opportunity to do so at the multimedia science blog Skunk Bear. These and other initiatives with which NPR is experimenting "show more promise and potential to meaningfully engage" with NPR's audience, Goo said. As for the space following a story that was previously used for comments, it now often includes a place for readers to sign up for a related newsletter or podcast. That has led to 500,000 new email subscriptions (about 42,000 per month) and almost 100,000 podcast subscriptions, Goo said. That's good for NPR, and perhaps a better use of the space, but it is largely one-way communication. 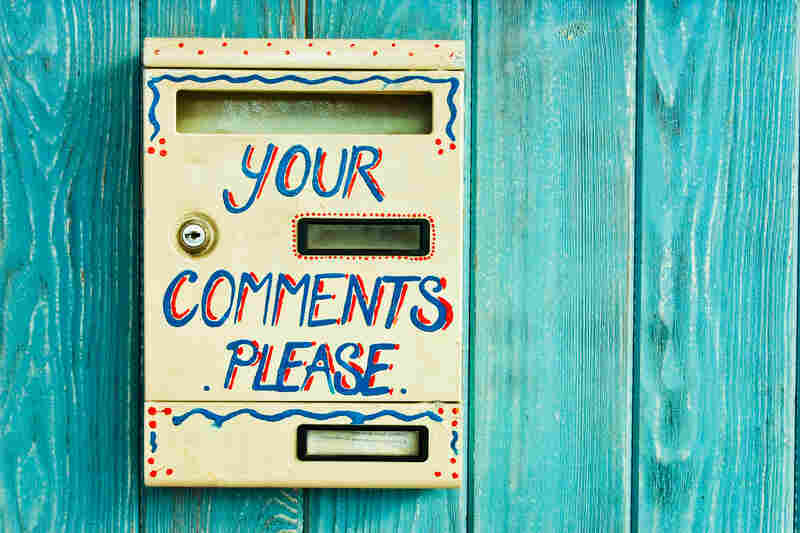 The other experiments are not a one-to-one replacement for comments, either, and I don't expect those initiatives will satisfy those who want to see commenting returned to NPR.org, given that many of them say they simply want to criticize NPR's reporting, or find community with other commenters around politics, in particular. For now, however, those NPR readers will need to use social media, or find an NPR member station site that still accepts comments (many do, as do Here and Now and two shows NPR distributes, On Point and 1A, which also invite listener calls and email).